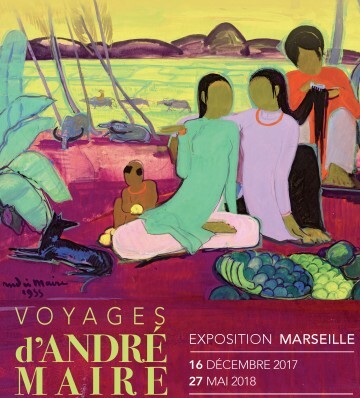 From the 16 of December 2017 to 27th of May 2018, the Musée Regards de Provence presents the retrospective exhibition "Journeys of André Maire". This exhibition highlights a passionate, curious observer, endowed with an unusual activity and a creativity always evolving. A traveling painter and draftsman, his abundant and evolving work tells the stories of his many voyages around the world in search of new sources of inspiration, in his quest of the beautiful and the great, his desire tp meet the other man, the other nature, the other civilization, the other religion or the other thought. Painter traveler and draftsman, André Maire, a student of Emile Bernard, is not part of any school or current. The evolutions and changes that appear in his creations are the result of his thoughts, his reflections, his research, his admiration. From his first trip to Indochina, he brings back an important work on the ruins of Angkor which will contribute to make known this site. He discovers the banks of the Ganges, Niger, Mekong, Nile but also Armançon, Angkor, Pharaonic temples, villages of Africa and the most secret places of Madagascar, Venetian palaces, Spanish cathedrals. .. This presentation reveals the crossed views between the West and the East of a sincere artist and a work, a true hymn to the “image” poeticized and exalted, timeless but real and alive. To discover the whole work of this adventurous, contemplative and sensitive traveler, is not to discover his world but to discover our world. André Maire . dessin . dessinateur . Explorateur . Humaniste . peintre voyageur .